This week in Your Parents Basement, we’re opening books to unravel the mysteries of a family squabble on a mystical island. From 1993, we’re playing the game that spurred folks to buy a CD-ROM, Myst! And on this week’s show, we have a special guest, friend of the show Jovial Jackee. You can manually download this week’s mystical podcast here, or subscribe to the show via the iTunes store. To manually subscribe, use this link in the device / podcast player of choice. You can also follow us on Twitter, or ‘like’ us on Facebook. 0:00 – Intro. “The Tower” theme from Myst. 47:45 – Emails. Jackee sticks around, and the gang talks Katamari Damacy and music peripheral games. – There are several playthroughs of Myst online, such as this one. – The storyline of Myst and its various sequels is incredibly complex and tangled, but Wikipedia does a decent job of hashing it all out here. And as you can imagine, TV Tropes has quite a bit of fun with the series. – For more information on the annual Myst convention, Mysterium, visit their website. – According to Price Charting, Myst is pretty affordable nowadays, if you want a physical copy. The PC edition is around $4, although as we said on the show, it can be a bit finicky to get to work. On Steam, the updates and re-releases of Myst go for around $6. Some of the rarer console versions, like 3D0, Jaguar and CD-I, range from $10 to $20. 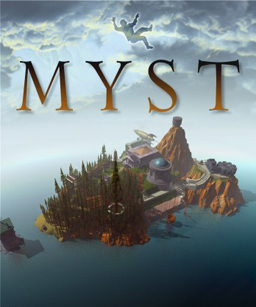 – Myst has a game spoofing it, called… Pyst. The concept is a tour of the island after four million people have toured it, and includes solutions to puzzles from the game scribbled on scenario. It got so-so reviews, and it’s out of print now. Oddly enough, this causes it to be worth more than Pyst, around $8 used to $20 new. For next week’s show, we’re covering Tecmo Bowl and Tecmo Super Bowl! If you’re interested in guesting, shoot an email to parentsbasementpodcast@gmail.com.